The process has certainly been worth it. Playing a bright German-style harpsichord with quick decay but plenty of colour and depth, Hantaï shows what can be achieved by a virtuoso who commands perfect technical control in which nothing is rushed or scrambled, a touch at the keys from which every note speaks clearly, and an emotional eloquence in which melodies sing and a subtle strategy of spread chords, hesitations, accents, displacements and articulations leads your ear to the music’s important notes, harmonies and rhythms, even in the most challenging passages. 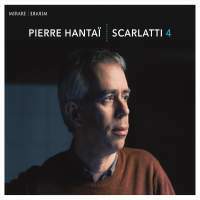 What extra ornamentation there is brings variety rather than show, and the beauty of the package is that it all sounds perfectly natural, the sublime result of artistic mastery committed to the task of communicating Scarlatti’s ever-delightful genius.